Today I ironed a new package of hankies that were recently washed. 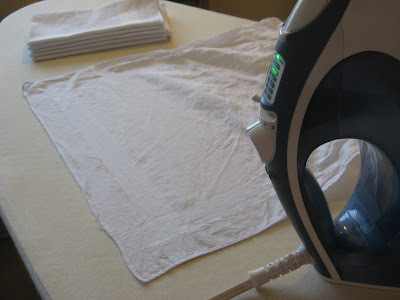 It reminded me of when I was little and my mom used to let me iron my Dad's hankies. That's how I first learned to iron. Side note: There's an empty (well sort of empty) room in my house for the next 3 weeks, so I can set up the ironing board in there for that short time. Right now the ironing board is always folded up in the corner of my bedroom upstairs, with the iron on the bathroom counter. Don't even ask me how lame this is when I'm sewing downstairs on the dining room table, and need to press something. Do Adam and your boys carry hankies? My dad does but there s no way I convince Dave to. I learned to iron doing the same thing! Adam does, and my Dad did big time. He had major Canadian farmland hayfever, so he always had a hankie in his pocket.